Please leave COLOR SELECTIONS and NEEDED ARRIVAL DATE in the "note to seller" box at checkout. 1. Please measure your thigh wherever you plan to wear the garters (usually 2-4 inches above the knee). 2. Using a flexible measuring tape, wrap it around your thigh and note where it overlaps. OR You may use a piece of string, mark the spot where it overlaps, then compare it to a ruler or measuring tape. 3. 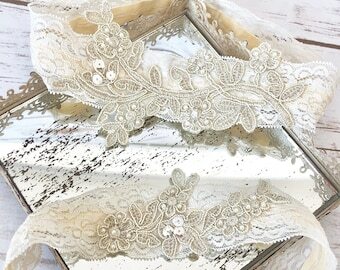 Please give us this EXACT measurement, as we will take out the appropriate amount of lace to account for stretch and ensure a snug fit. DO NOT take any inches off. 4. If no thigh measurement is given, a generic will be sent. PLEASE READ OUR MAIN PAGE BANNER AS WELL AS OUR SHOP POLICIES BEFORE PURCHASE. Please leave needed arrival date in "note to seller" box at checkout, otherwise we cannot guarantee arrival. Any custom order options please convo me before purchase. Absolutely love this beautiful handmade garter !!! just the right hint of gold and ivory. cant wait to wear it on my big day! 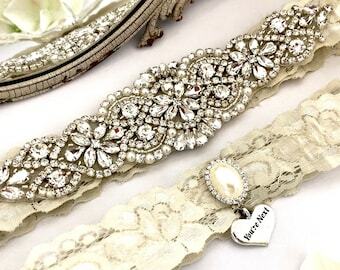 Beautiful garter set! Quick shipping! Will post pics after wedding! Thank you! Payment is due at checkout. TRD accepts PayPal and credit cards. Returns and exchanges are accepted within 3 days of delivery. Please fill out the form on the back of your invoice and return to the address provided. Due to the nature of handmade items, a 15% restocking fee will be applied to all returned items. No shipping fees will be reimbursed for any reason. Processing times are subject to change and does not include ship/mail time. Report to us lost or damaged items within 3 days of receipt and we'd be glad to help you in anyway we can! USPS tracking terminates upon leaving the country, please reach out to your local post and provide them with USPS tracking number and they can provide you with further tracking. We are not responsible for any customs taxes that your item may incur. Hours: Mon-Friday 8 a.m. - 5 p.m.
We do the best we can to reply to all messages in a timely manner. We will be in touch within 24 hours, Monday-Friday. Please leave all of the following in the Note To Seller Box at checkout. Missing information may slow the process time of your order. Please understand you are purchasing a handmade product. Part of the uniqueness of these items are their imperfections. They are made with the highest quality products and craftsmanship to ensure a high quality item you will love! All headbands worn by children under age 6 should be carefully supervised due to small swolloable parts. Lastly, please understand we reserve the right to refuse service to anyone at any particular time. We take pride in doing honest, quality business with my customers. Our goal is to provide you with a beautiful item that you love and a great experience along the way. We take extra care in packaging all of our items before shipment to ensure they arrive in mint condition. Though the frequency of damaged items shipped from TRD is very very low, breakage does occur from time to time. We include shipping insurance on each shipped order in the event damage should occur. Should you find your item has been damaged, please take a photo of your broken item inside the box with packaging along with a photo of your shipping label on the outside of the box. Please send these photos to us and a description of the items broke. We will be happy to replace those items as quickly as possible! Please be very careful when opening candle orders as broken glass is sharp and can cause injury! It is your responsibility to enter the correct shipping address during checkout. Unfortunately, we cannot be held responsible if you entered the wrong address. No refunds will be issued for incorrect mailing addresses or undeliverable items. If an item is returned to us or needs to be re-sent, it is your responsibility to pay for the additional shipping charges. If you catch the address is wrong before shipment, please contact us and we will be happy to enter the correct address for you! All candles, flower girl baskets, and ring bearer pillows are shipped USPS Priority 1-3 Day Mail. 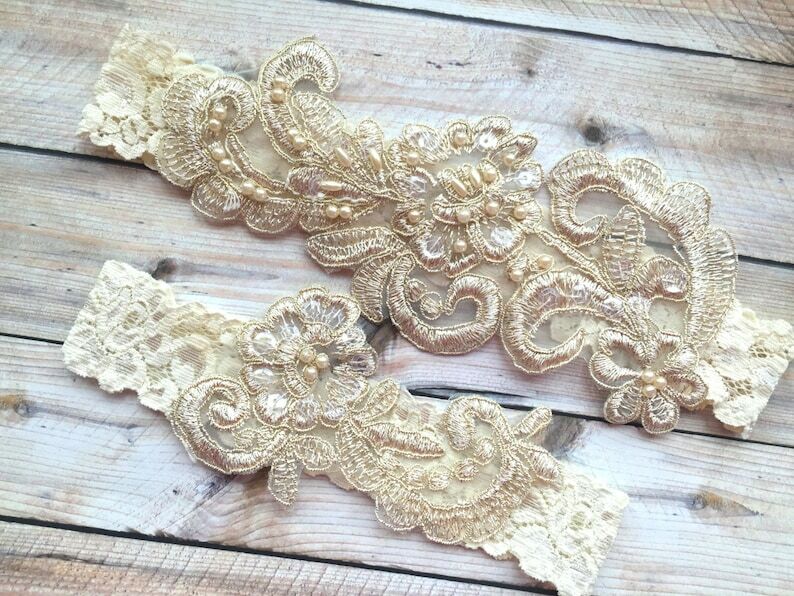 Garters, sashes, headpieces, headbands, and hair clips are sent via USPS First Class Mail standard. Priority 1-3 day mail is available for all items at checkout. We have broke down shipping costs to make it as inexpensive and timely as possible! Where do I leave my personalized text? Personalized items will have a special text box to include your text. Please be sure that spelling is correct as we will print exactly what the text reads. Any additional information should be left in the Note To Seller box at checkout. Feel free to contact us with any customization questions prior to purchase! Garters: My garter is too big or too small? We offer free resizing! Please fill out the exchange form on the back of your invoice and include the size you'd like to exchange for. All shipping fees incurred is your responsibility. Candles: Frosting and Wet Spots? Due to the nature of soy wax, frosting and wet spots may occur due to temperature change. Some candles may develop clear "wet spots" on the outside of the candle. Others may have a bit of "frosting" which is a flakey appearance. Neither will affect the performance of your candle and are completely normal traits of soy wax candles. No refunds will be issued for either trait.